By popular demand, I am writing a post for my petite readers. I asked my colleague Dee, who is petite, to collaborate with me and to do some research. It was not easy as several of the Department stores no longer seem to stock specialist petite brands. MarksandSpencer has a special petite section and Nordstrom offer many of their styles in petite. You can, of course, have your clothes altered, trousers shortened and sleeves taken up. This can definitely work however it is not always the solution as petite ranges are designed and cut specially for the smaller woman and tend to be more in proportion. For my UK readers who are having problems finding trousers that fit you might like to check out Distinctively Me where you can have trousers made to fit you perfectly. One of the best tricks for looking taller is to keep the bottom and top half of your outfit in the same or similar colour tones. Heels help, however I am aware that many of us no longer want to go the heel route for foot comfort reasons. Wedge heels can be a good substitute. 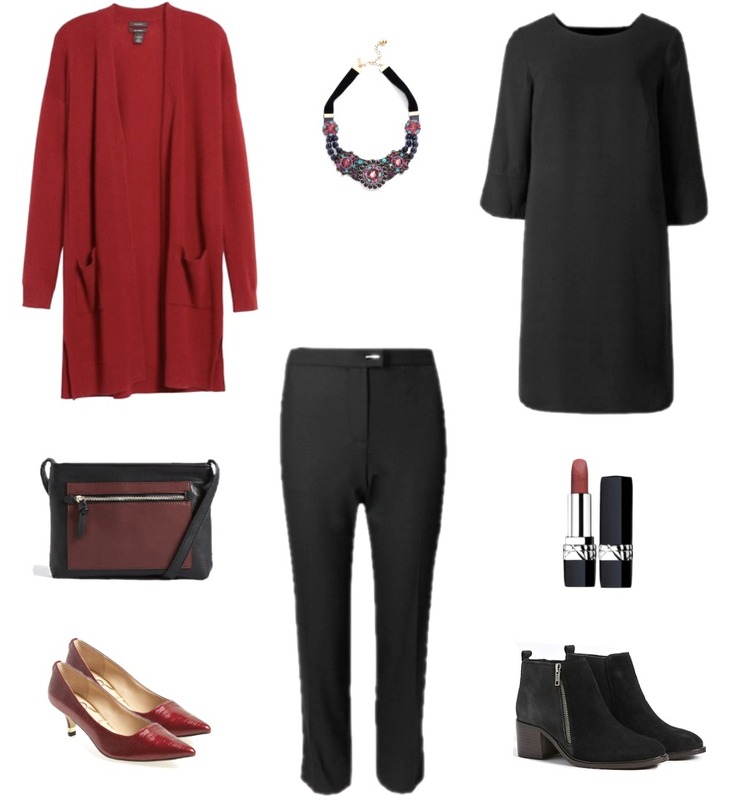 Details of above: Red long cardigan Nordstrom // Multi coloured necklace // Black tunic dress Marksandspencer // Black ankle boots Marksandspencer // Black trousers Marksandspencer // Red court shoes Nordstrom // Black/burgundy bag Marksandspencer. Instead of visually splitting your body in half, think in terms of thirds. A good option might be a two-thirds length tunic with leggings, narrow trousers or a shorter top with high waisted (wider) trousers. Alternatively a short cropped jacket or cardigan with a shift dress. Consider monochrome or fewer colour variations in the same outfit. Dresses on petites are a great option. A good look would be an edge to edge jacket or cardigan the same length as your dress. High waisted trousers will make your legs look longer, especially worn with a shorter length top and a heel. Go easy on oversized accessories, bulky textures and too much layering as these may overwhelm. Remember to get a good fit, correct size and length. A bad fit can be especially unforgiving on a petite. If you love to wear patterns, remember to keep these on a reasonable scale and if wearing stripes, stick to slim and preferably vertical lines. 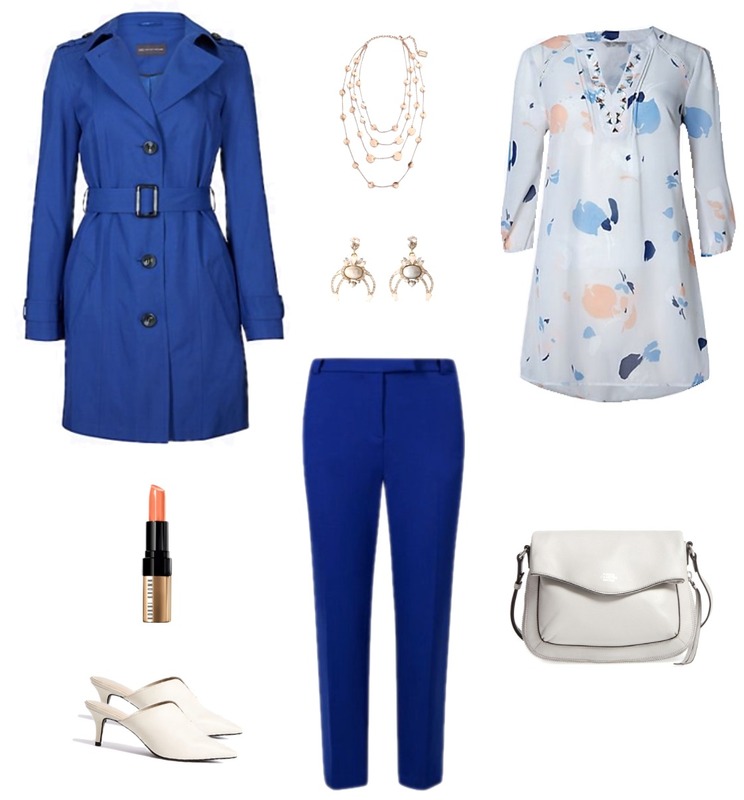 For more outfit ideas for petites in a previous post click here. The above are just guidelines. Do join the conversation and share any ideas you have discovered as a petite woman. Previous Post Sneakers/trainers – Should we or shouldn’t we wear them? Thank you for this post. I have struggled all my life with clothes that do not fit a petite person—shortening the sleeves and re-hemming trouser and skirt lengths. Of course, this only helps with the length, not the overall proportions, so the clothes still do not look exactly right. This is a real dilemma for those of us who must shop with a very small budget. I have also noticed that several options scaled for petite sizes have disappeared. I’m in the US and rely mostly on internet shopping for the few options available. I don’t really think I will ever look taller than I am but I don’t want to look like a child in her mother’s clothes either. Thanks for your comment. I would suggest keeping your outfits clean and simple, maybe sticking to one colour plus an accent colour. If you choose proportional elegant accessories that will assist you in looking chic and mature. I am just borderline petite…but yes, have always loved long tunics with ankle length leggings. Now I know why! I used to like a brand called Minuet which is no longer available but you can still find pieces on E-bay. They are smart clothes so tend not to be worn very much. I prefer to wear dresses as I’m evenly proportioned and they often have large bright prints. I buy jersey trousers in M&S for winter and sightseeing etc. I’m not keen on jeans and only have one pair which came from Dash in a short length and fit OK. The worst problem I have is sleeves on knitwear that can’t be altered – the ‘over the hand’ look is not me! As to the former post I won’t be paying £400 + for Ferragamo shoes. I need a deep toe box as my big toes seem to stick up and I can’t take pressure on them for long. I had a pair of Hotter shoes which initially seemed OK but I had to give them away because they were so painful in that area. Thanks for the posts, always interesting. I think I remember Minuet. Many of the Petite concessions just seem to have vanished.I have a friend who really likes Hotter shoes. They have never really appealed to me. i agree with Libby. Long tunics (but not too long – I find 27′ long enough) and leggings are perfect, even with flat shoes. i am only 4′ 11″ and I find I can wear a patterned dress if I wear a plain long cardigan/jacket over it. Bon Marché do a jegging which is perfect for the older lady on a budget. They are in a heavier weight fabric so don’t show every lump and bump and have a flattering raised seam detail. A lot of their clothes are a bit “old lady’ but there is occasionally a little gem for the petite lady. Damart do a “perfect fit” trouser in shorter lengths and I find this good fit, too, and not expensive. A lot of ranges suitable for the more mature among us assume that we are all overweight and I struggle to find skirts in size 8 which suit my age and height. M & S have them some times. I agree with you in that I find Bon Marche a bit old-fashioned. However, I will check out the jeggings you recommend. Damart is also good I have used them before. I used to think that about Bon Marche, but recently they have had some pretty things, (if you keep popping in to check) and smaller sizes. I have two pin-tuck tunic blouses from there, much complimented. Last week they had a cherry red padded gilet with matching red and white long sleeve tee shirt, if anyone’s feeling nautical. Also Marks and Spencer fashions are looking better this year, especially blouses. Thank you for the article – and yes, you are right many stores no longer carry a petite range. Also thank you for you comment re “proportion” – too many sales staff think it is just a matter of “hemming”, which, of course, it is not! I am in Canada, but have found US stores (online and “in person”) much more “petite” friendly – Landsend and Talbots to name a couple. Love your posts! Thanks for reminding me of Landsend. I like their stuff and will check out the Petites. They also have a UK site. 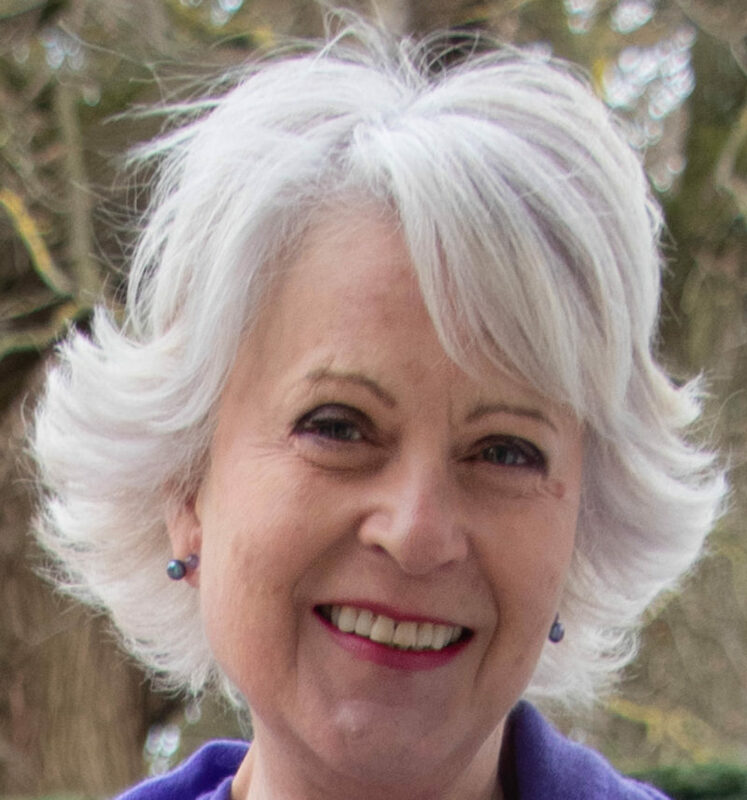 Yes – especially Landsend outerwear – they have jackets and coats for all seasons in many styles – good quality for reasonable prices – and they almost always come in petite plus other speciality sizes. I’m 5′ 2″ and shrinking so sometimes even petite sizes are a bit too long! None of the top designers seem to offer petites either. I bought a Lela Rose dress for a wedding and had to have it altered and still the proportions seemed to be off. I usually stick with Talbots for petite jeans and Eileen fisher for some dress up pieces. Unfortunately I can’t get out of my tonal all black look although it’s probably the best for a long lean look. Grey looks hideous with my coloring and the EF bone color washes me out. Navy, meh. I do like the tunic and legging look but usually wear high heeled boots or heels. LOve your blog and thanks for keeping us vertically challenged ladies in mind. If black works for you I would stick with it. High heels if you can wear them are definitely a good idea for adding height. I’ve noticed that some M&S trousers seem to have got shorter which won’t help a taller lady but it will help us short ones! I’m only 5′ 3″ (maybe a bit less now) and I’ve had to buy their regular length rather than their short length a couple of times now. I agree Wendy M&S have changed the cut of their trousers. A size 12 used to work for me. I tried a pair on the other day and they were too tight on the carves and as you say much shorter. I definitely take a Long and even then they only come to my ankles. I am 153cm (5′ ) tall and recently found a great tip for dresses with a darted waist. I tried on a size 10 in a beautiful soft fabric and as usual the waist sat at mid, older woman’s tummy level. The shop assistant suggested i try a 14 and then pinned it in under the arms and tapering down almost to the waist. Perfect. It then skims lightly over the tummy and flows but doesn’t look too bulky because of the fabric and the darted waist now sitting lower but giving tummy room in the larger size. Thanks for sharing that tip Lynne. Sometimes we have to be creative to get our clothes to work for us. Anybody else got any useful ideas. Some great ideas. Had not heard of thinking in thirds; however it makes sense. Lands End has petite and plus petite clothing for casual wear. Thankyou. Love this article! These are some awesome outfits and outfit ideas. I really like this article. Thanks a lot for sharing.